We will work closely with you to personalize your invitations, announcements and various paper goods for your special occasion. Continuity and beautiful details are at the foundation of our custom design work. We look forward to creating designs that communicate your unique story and personality. 1. Design Consultation - We will discuss your event, budget and the details i.e. location, flowers, mood and style. The more we know about you and your interests the clearer our design vision will be. 2. Contract - We will create an estimate and contract based on our conversation and the number of invitations you require. After we receive the signed contract with a 50% deposit we will begin the design process. 3. Design proof - We will send you a design proof and you can either approve the design or we can discuss the changes you would like to make. After changes are made and you sign off on the final design we will begin printing. 4. Payment & Shipping - After the final balance and shipping costs are paid in full we will mail your invitations and other supporting materials to you. Our turnaround time is 3-4 weeks for custom design work. 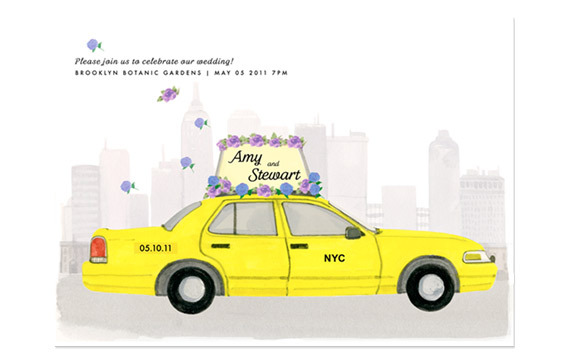 We designed this invitation for a couple that met each other while sharing a taxi cab in New York.